This "Historically Speaking" column was published in the Exeter News-Letter on Friday, June 6, 2014. Are there secret tunnels in Exeter? Lots of towns have stories about ‘secret tunnel’ systems that a few people say they’ve seen at some time in the past. Yet, none of these mysterious tunnels have ever been found. Most of the stories have connections to the colonial period or the Underground Railroad. Exeter is no exception to this type of legend and there are two tunnel stories that persist to this day. There is also no evidence that the Underground Railroad existed anywhere near Exeter. Many of us were nursed through our nation’s troubling slave history with calming stories of devoted white northerners who hid whole slave families in hidden rooms of houses, spiriting them off to Canada through tunnels with secret signals. There are no accounts in the newspapers or town records from the early nineteenth century to indicate that fugitive slaves were seen or pursued in Exeter. But for many years, children in town were taught that the Odiorne Bickford house on Cass Street was a ‘station’ on the Underground Railway and the evidence was a hidden room. To be fair, there is a hidden room in the house. I’ve been in it, but it’s not so much a hidden room as an architectural feature caused by a dead space around the chimney. Lots of old houses have such spaces. The house seems to have become part of the Underground Railway sometime around the 1950s, when the civil rights movement was heating up. During that time, everyone wanted to be part of the Underground Railway, and since there was little documentation about it, every crevasse or attic crawl space was considered proof. The house on Cass Street has a slightly troubled history with slavery in that slaves actually lived there for several decades. Perhaps the story evolved as a means to atone for its earlier history. At some point, the hidden room stuffed full with slaves grew into a passage through the floorboards that led to the basement and a tunnel that led to the river. Let’s be clear – there is no tunnel in this house. It sits on sandy soil and like all the neighboring houses, has to have a sump pump running nearly all year. There is an underground stream that runs through the yard. The amount of effort it would take to dig and maintain a tunnel would have been extraordinary, not to mention unnecessary considering the house sits roughly 1/16th of a mile away from the river. Why do these stories exist? Are we that gullible, or do we simply like the romance of a tall tale? Peter Smith, who taught at the Exeter Junior High for decades, remembers the tunnel stories well. He summed them up well as, “a good gimmick to get kids interested in history, it’s gloomy and dark, but probably not too feasible.” Perhaps someone will really find a secret tunnel system in Exeter (aside from the very real ones that exist at Phillips Exeter Academy – but that’s a story for another time), and we can then marvel at our ancestor’s cleverness. But for now, the evidence just isn’t there. 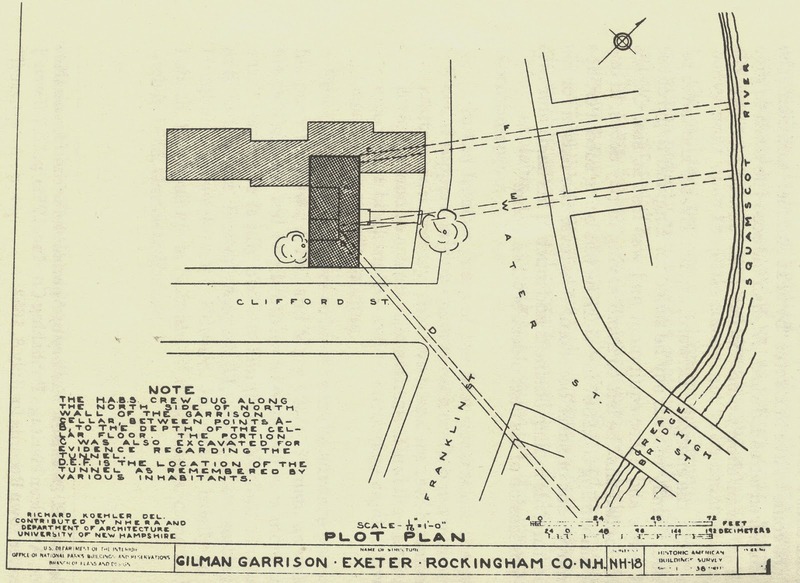 Image: Map from the Historic American Building Survey done in Exeter in 1936 shows three different locations for the tunnel that, according to local legend, runs between the Gilman Garrison house on Water Street to the river. No tunnel has ever been found.